The act of getting dinner on the table every night is a slog. 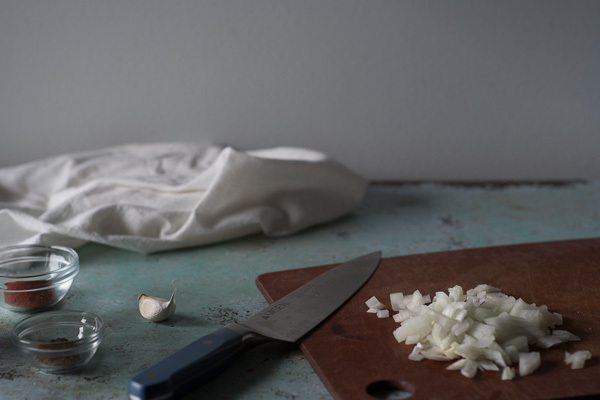 It’s not that cooking is particularly difficult or that there isn’t plenty of joy to be found in the creative alchemies of the kitchen on a lazy Saturday. But most cooking, the relentless, everyday kind, is a chore. And not just a simple chore, like vacuuming, but a vast multi-part chore that involves planning, shopping, prepping, cooking, and cleaning up. And that doesn’t even get into the complexities of balancing competing health claims, various household members’ dietary restrictions and preferences, and the depletion of willpower by the end of the day that can leave us staring, wide-eyed, into the abyss of the refrigerator ready to chuck all of our wilting good intentions into the compost and just order Indian food. Again. I cannot solve all of this. 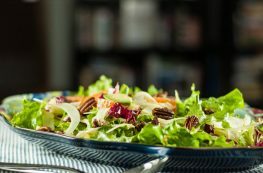 But I can point toward something that helps: having a repertoire of simple, mostly-from-the-pantry dishes that you can turn to again and again. Something that works, that tastes good, and that after making a couple of times, won’t require looking up a recipe or thinking too hard. Something that you can tweak to your preferences and that is mostly healthy. 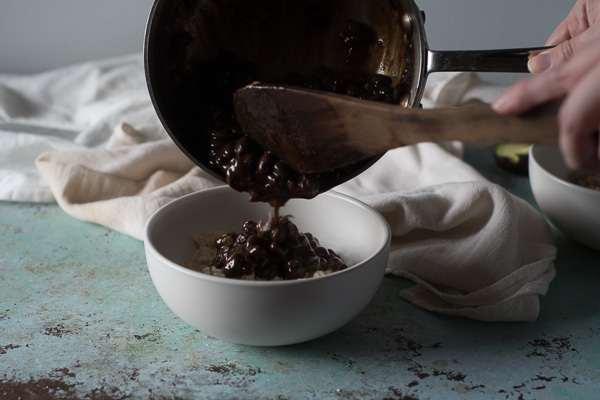 Enter one of my most durable standbys, black beans and rice. There are about a million different ways to make this (and at some point I’ll tell you about my pressure cooker black beans that start with dried beans), but this version starts with a simple can (or tetrapak or jar) of beans, involves an onion, garlic, a couple of dried spices, and extra hit of umami from soy sauce (or tamari for gluten free folks), and a bright splash of acid from sherry vinegar at the end. There’s a minimal amount of chopping, just a bit of onion and garlic. 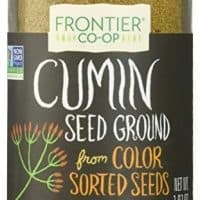 It gets some depth of flavor from smoked paprika and cumin, the flavors of which get woken up by getting sauteed in a little bit of oil with the onion and garlic. With white rice it comes together in about 25 minutes, with brown rice in under and hour. You can top it in dozens of different ways. Add a bit of avocado and salsa if you want to keep it dairy free. 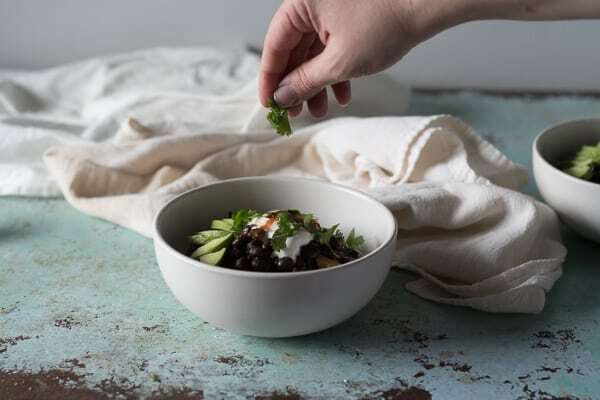 Add a dollop of something creamy (plain Greek yogurt, crema, sour cream), a sprinkle of shredded cheese, a few dashes of hot sauce, or a sprinkle of cilantro if that’s your thing. You could certainly add sliced scallions or jalepeño, and pickled red onions would be fantastic here. 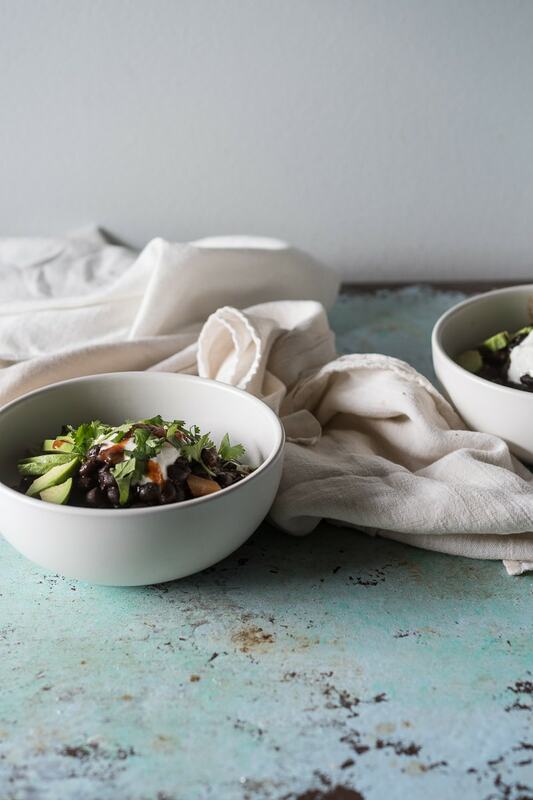 I also love topping a black bean bowl like this with a runny fried egg. It’s easy to scale up for as many people as you want to feed. 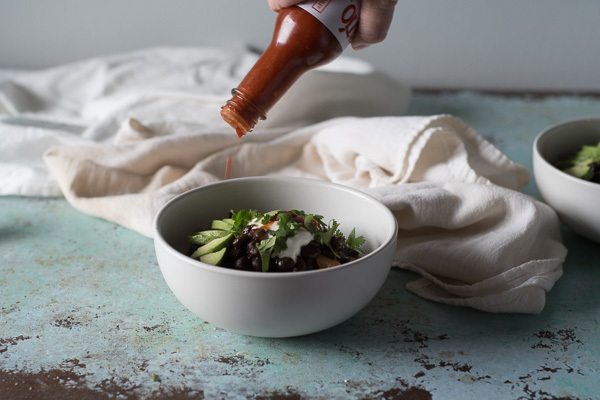 And you could make a big batch of black beans and use them in anything from burritos to nachos to huevos rancheros throughout the week. Dinner, for tonight at least, is solved. This meal is a simple weeknight staple. The trick is to bloom the cumin and smoked paprika in oil along with the onion and garlic to bring out the flavor, use the liquid in the canned beans to create a full-bodied sauce, add a bit of savory umami flavor with soy sauce (or tamari to keep it gluten free), and add of bit sherry vinegar at the end to brighten the flavors. You can make this with white or brown rice. When using brown rice, I prefer to use the short grain variety for its pleasing nubbly texture. The sky's the limit on the toppings. Use whatever you like. I usually top it with some plain Greek yogurt, salsa, avocado, and a dash of hot sauce, but shredded cheese, sour cream, scallions, diced tomatoes, pickled onions, a runny egg, are a few of the topping that I'd recommend. Use whatever you like. This recipe is for two servings using a single can of beans, but it would be easy to double or triple to feed more people. 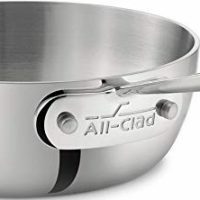 The more you scale it up and the narrower and deeper the the saucepan you use, the longer it may take for the liquid to reduce, so keep an eye on it and allow a few more minutes for it to thicken if necessary. Add the rice to a small saucepan with a tight fitting lid. If using white rice, add 2/3 cup of water and a pinch of salt, bring to a boil, reduce to a simmer, cover and cook over low heat for 15 minutes. 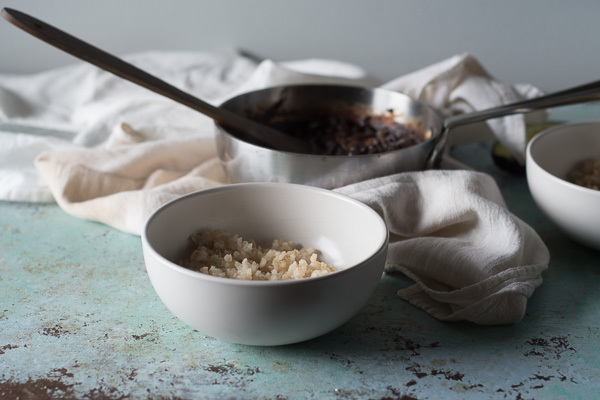 If using brown rice, add 1 cup water and a pinch of salt, bring to a boil, reduce to a simmer, cover and cook over low heat for about 50 minutes. Turn off the heat and leave covered until the beans are ready. Meanwhile, heat a saucepan over medium-high heat. Add the oil and the onion, and cook until the onion is beginning to brown, about 3 minutes. Add the garlic, smoked paprika, and cumin, and saute for about 1 minute or until everything is fragrant. Add the beans in their liquid and the soy sauce or tamari. Bring to a boil, reduce to a simmer, and cook until the liquid has reduced to a glossy, stewy thick sauce, about 20 minutes. Add the sherry vinegar. Taste, and season with salt if necessary. We make something very similar and it always goes down well. They are really good in tacos too. I love the versatility of black beans like this. You’re right that they’re good in tacos. I also use them on nachos, in burritos, and in huevos rancheros. Lots of ways to use them! 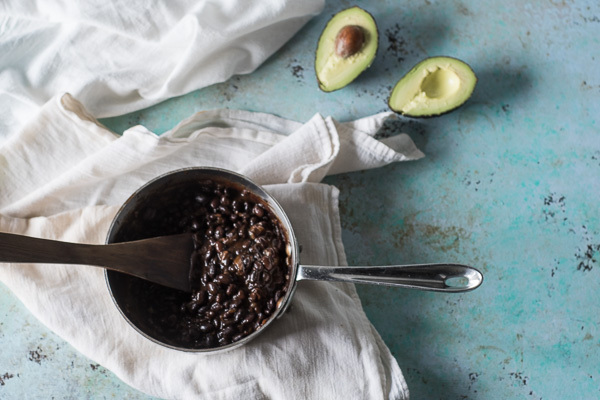 This is so minimal and so beautiful, I love black beans and rice, it was one of the first things I learned to cook for myself. I slather it in lots of hot sauce! Thank you! I think it’s among the first things many of us learn to cook! I love that it’s cheap and accessible and doable. Ha ha, it was so funny to read about the dilemma of cooking dinners and caving in to order Indian food! I do the exact same thing too! 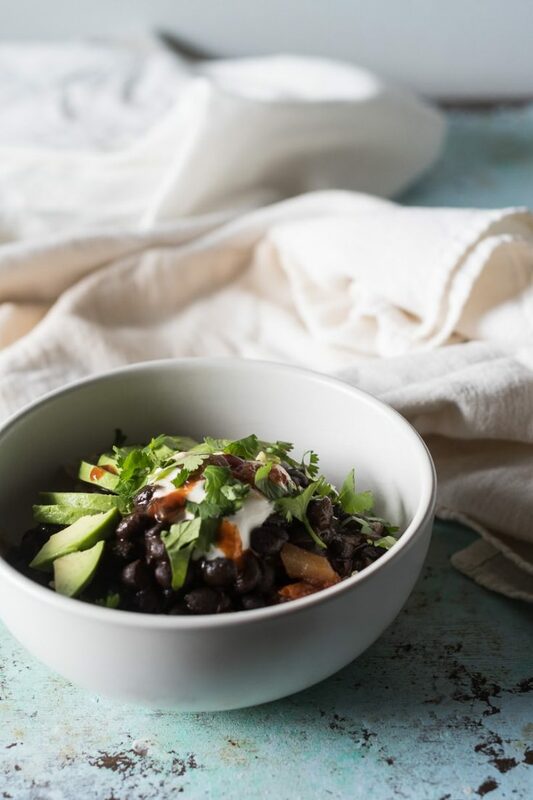 I like adding a lot of lettuce to my black bean bowl – for a lot of crunch!